← Who has a guinea pig? Princess Piggy Poo enjoyed a full house this week — mine, not hers. Her grandparents — my parents — were visiting from Florida. Princess Piggy Poo and her big house were relocated during the visit in order to make room for my air mattress and to keep her tucked away so no one would trip over her home. The image of the thin wire constructing her home crumbling under the weight of my mother, father or me and flattening the wooden hiding house smashing my furry friend underneath was more than I could handle — better to be safe than sorry. I put baby in a corner. While the new piggy palace does take up a good bit of room, since purchasing the larger guinea pig house, I have noticed that Princess Piggy Poo seems much more content. Even though Princess Piggy Poo still spends most of her time tucked into her hiding house, she seems to enjoy the extra room. The other day I saw something I’ve never seen before: a cavy with closed eyes. Well, to be more specific, a cavy with closed eyes without me stroking the top of her head or sides of her cheeks. Princess Piggy Poo was simply lying in her house and resting her eyes. 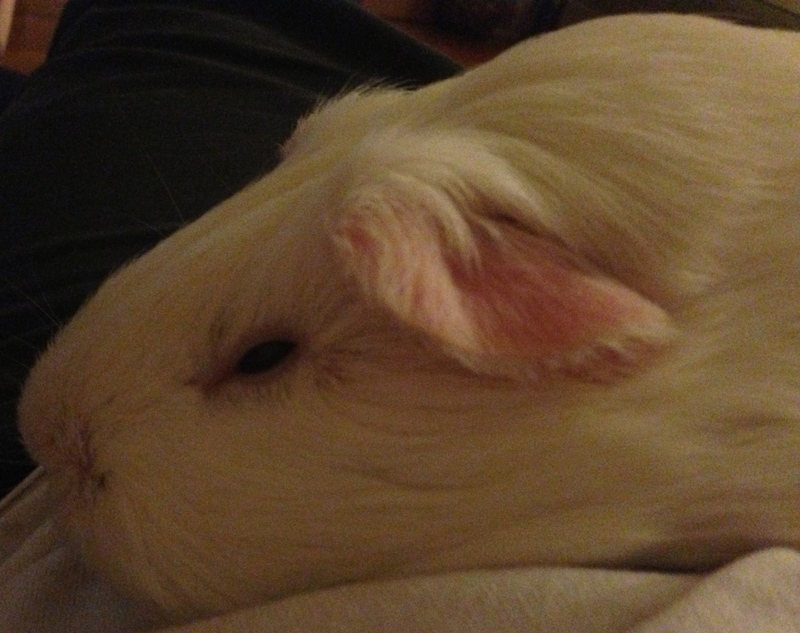 I was so pleased to see Princess Piggy Poo chilling like a sleepy puppy instead of dashing like a skittish cavy. Maybe taking credit for providing her a safe haven was a little much, but witnessing her eyeballs at half-mast was even more gratifying than discovering her love of Italian parsley.